UAH global temperature – little change in October | Watts Up With That? 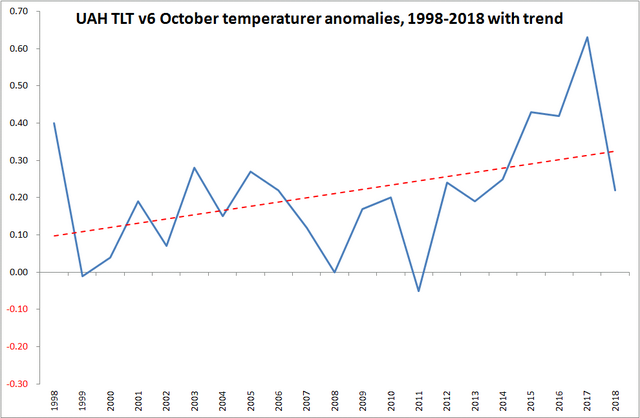 The Version 6.0 global average lower tropospheric temperature (LT) anomaly for October, 2018 was +0.22 deg. C, up a little from +0.14 deg. C in September. The linear temperature trend of the global average lower tropospheric temperature anomalies from January 1979 through October 2018 remains at +0.13 C/decade. The UAH LT global anomaly image for October, 2018 should be available in the next few days here. November 3, 2018 in Climate News. The Arctic was much warmer (0.9 deg C) in October than in September. The US was much cooler (0.6 deg C) in October than in September. That ain’t no hockey stick. God, I love reversion to the mean in the morning. From 2012, Mann is holding it. This October was essentially the last hurrah for the lingering warmth of the Great El Nino of 2015-2016. The lingering warm waters off the Baja California peninsula are gone, the increasing cold of the North Atlantic (south of Iceland), and cooler water off of western South America are growing. This winter’s coming El Nino will likely develop as a mild Modokai event (warmer water surfacing nearer Hawaii than South America). So there will be some effect from this event, but it will be short-lived. Water temps will be getting colder but air temps will remain warmer due to water vapor. I think Greenland is in for more gain in surface mass balance this winter. Can anyone explain the big increase in HAD 4 Crut data since Jones’s “naughty boy” BBC interview in 2010? Back then he claimed that the 1975 to 2009 trend was 0.161 c/dec but today using the York Uni tool it is 0.193 c and the 2 earlier warming trends are today lower than in his 2010 BBC Q&A. I suppose it’s one easy way to find some extra warming to enhance your CAGW nonsense? Certainly is MAN MADE warming, no doubt about it. Here’s the York Uni tool and I used the global UAH 4 Crut krig. http://www.ysbl.york.ac.uk/~cowtan/applets/trend/trend.html And here’s his BBC interview Q&A in 2010, see Question A with the 4 warming trends that have now been suitably adjusted to crank up their CAGW alarmism. Oh and don’t forget this is the IPCC’s preferred data-base. Any ideas? I just wish Willis could look at this data and offer his opinion? This is the longest data-base and yet nobody seems interested at all. But heck what’s an endless wastage of trillions $ down the drain for a zero return, certainly doesn’t worry China/ India and their soaring co2 emissions at all? In fact their laughing all the way to their banks. I get 0.186C/decade, from Jan 75 to Dec 09. The difference is probably that they have included a lot more Arctic stations, which were lacking in earlier versions. Nick using York uni tool 1975.1 to 2009.9 shows a trend 0.192/ decade. And we shouldn’t be checking it against your data-base anyway. I’m interested in HAD 4 Crut trends then and now. Just since 2010 interview or about 8 years ago. So what about reducing the 2 earlier warming trends as well? You need to enter either 2009.99 or 2010 to get data up to end 2009 (see the footnote at the site). That gives 0.186 ±0.042 °C/decade (2σ) in HadCRUT4 between 1975 and 2009 (inc.), as Nick says. The only database that counts is the UAH one. When the data temp goes back down to equal the level in 1979 at one of the coldest periods, that will be the last nail in the coffin of the CO2 scam. At that point Nick will keep swearing that you cant trust the UAH data, but everyone else will know the game is over. Unfortunately this might not happen for 10 years. The trend I quoted, was HADCRUT 4, and matches Jones period to end 2009. I don’t know of one. UAH do it on their data file. My eyeball estimate of the UAH data is from -0.2C in 1979, to +0.2C now, over 4 decades, a mere! 0.1C per decade. I’m doing a crude visual averaging to get “typical” temperatures in 1979 and 2018. Why were they lacking? Did they exist? And if they did why were they not included before? As I understand it, when the Soviet Union fell, much of the data from their Siberian stations were no longer included. That step-up El Nino event in 1998 is sure evident and impressive. Has Dr. Roy ever explained the use of the 13-month average? Seems like an odd number to use as the basis for an average. A 12-month average removes the seasonal cycle, but the 13th month reintroduces it to a small extent. Mathematically, that makes a lot of sense. Thanks! All that global warming-caused continental cooling looks mighty scary. It’s just a probability map. Goes to show what colourization does psychologically. It could be correct and be within .1 degree of normal temps everywhere. The Super El Nino spike over, the Plateau has returned, if not indeed global cooling. The same anomaly as 12 years ago and well below 1998. 1998 was heavily influenced by El Nino, of course. Also, if you run a linear trend line through that October data, even though it starts in an unusually warm year, it shows warming (+0.13 C per decade). Rubbish. The data is clearly and obviously trendless. There are only three years warmer than the start point, and two of those only by tiny amounts. There are far more years that decrease from the starting point and by more than the highest increase. How can you have an increasing trend when there is literally no increase? Just look at the data rather than run a line-fit. The average of the numbers us 0.22! Rubbish. The data is clearly and obviously trendless. Then Microsoft Excel is lying to us. There is a clear upward slope to the trend which is easily visible on the chart. By all means check this for yourself. Well to get a climatic data point you need sbout 30 years,to get a climatic trend more than 30 years. So trend yes, but a twenty year slice is inconclusive by itself. Just re-checked and the October warming trend in UAH between 1998 and 2018 is +0.11 C/dec, not +0.13 as previously stated. My mistake. Even so, it’s a clear warming trend, despite this lower value in 2018. DWR54’s trend is simply measuring noise. Strong La Nina early in the data and strong El Nino years towards the end. If you correct for ENSO effects you will see the trend is essentially zero. If you don’t understand what you are measuring then you probably shouldn’t even try. It would be much better to find years with similar levels of climate effects and compare them. Strong La Nina early in the data and strong El Nino years towards the end. If you correct for ENSO effects you will see the trend is essentially zero. That may be the case. I agreed with Hugs above that ~20 year periods probably aren’t enough to remove the influence of natural forcings. That’s especially true when those periods start and end with big ENSO fluctuations, as you say. In my defense, I didn’t pick the date range. Let’s hope this new drive to remove reliance on short term ENSO-influenced trends is applied across the board though. I notice that some folks are already proclaiming ‘global cooling’ based on what was pretty much a widely expected temperature decline that followed the El Nino that peaked just 2 years ago! I hope we can all agree that whether whatever trend might be derived or not, basically, nothing important is going on in global T.
It will be interesting to see whether 2018 turns out colder than 2002. As a crude estimate, the total of the monthly anomalies in 2002 was 2.60, and the total for the 10 months so far in 2018 is 2.18. So, very roughly, if the anomalies for November and December are slightly down on last month 2018 will be cooler on the stats (though by an infinitesimal amount presumably well within the error bars) while if they’re the same or up 2002 will likewise be cooler on the stats. As I understand it, 2002 wasn’t a noticeable el nino or la nina year, while 2018 has seen an el nino watch and may see a mild el nino develop. So however this year pans out, it seems highly likely that two years 16 years apart and not greatly different in el nino/la nina status will show only negligible difference if any in warming anomalies. According to the NOAA index, 2002 was heavily influenced by El Nino starting MJJ, peaking OND and ending JFM in 2003. Whereas 2018 started off in La Nina conditions that only ended FMA. Conditions have been neutral since. I would suggest averaging 2001 and 2002 to get a more neutral ENSO reading. However, averaging the entire year also leads to measuring the AMO. To avoid most of the AMO effects I use only spring/summer months (April-September). It’s clearly an atrophying rather than amplifying Nino trend so we can probably forget about an El-Nino for the time being. Plus the sustained equatorial and trade winds are also contrary to El-Nino development—as you look forward the easterlies remain. In fact the rain and storm activity in the far east Pacific is also tapering off to a much lower level. A question to anyone concerning average monthly temperatures…. The U.S. Climate Reference Network (USCRN) has been fully operational for about ten years. How well do the “pristine” data from the USCRN match up with all the other weather data collected in the USA? Very well. Here is the main graph. Interesting to note that the current temperature is the same as 988. It was probably warmer in 998. But the Vikings didn’t fudge the temperature. They shucked off a fur on good days. I am very eager to see how all this resolves itself, which it will in due time. I only fear that I will not live long enough to know the outcome. Unfortunately, that may be the case for everyone alive today. If the chart started in 1980, then total warming to Oct 18 would be .2 degrees. It’s like stock market charts, whether you measure from peak to trough or trough to peak makes all the difference. What a crazy discipline. It would indeed be crazy to do that, which is why scientists don’t. It’s hard to get crazy past peer review. Outright fraud works fine though. How else do you explain Michael Mann? The current El Niño cycle looks like it will be weak to moderate one, and is currently expected to peak in around April 2019. The next La Niña cycle will likely be a strong/cold one as we haven’t had a strong one since 2011, and strong La Niña events usually occur every 10 years or so. From around 2021, the PDO, AMO and NAO will all be in or near their respective 30-year cool ocean cycles and a Grand Solar Minimum event will also start from around 2020, which should add to global cooling. By 2021, the disparity and duration of disparity between CMIP5 global warming model projections vs. reality should exceed +2~3 standard deviations for 25+ years, which should be suffient criteria to officially disconfirm this silly CAGW hypothesis for good. This CAGW insanity is getting so close to finally being disconfirmed. The longer the period of low solar activity continues, the chance of strong La Nina’s become very rare and far between. There has been a good reason why El Nino’s have dominated especially since then and to less extent before it. A strong La Nina has failed after the last strong El Nino unlike the one before it. It won’t be for another year until we know how the recent strong El Nino has affected the longer term global temperatures. The warm ocean temperatures around 150m to 200m depth are now appearing at the surface, so temperatures are quickly rising around NINO 3 + 4. There has been in recent weeks a large positive anomaly develop there at depth and that means El Nino more likely to become in near future moderate strength rather than a weak one. Unfortunately, hiding the decline is still evident and they will do what they can to continuing implementing this with especially the surface part data sets and RSS joining the bandwagon. Start doing all graphs in Kelvin.